I replied you to PM. Also you can use the link from my signature to register. If have any questions, just ping me. Great news for publishers and affiliates using iMonetizeIt CPA Marketplace (monetizing traffic through single CPA/CPL/CPS/CPI offers). Recently we've launched a rewards campaign - we give interesting prizes that directly depend on your earnings. Check more details here. Are you going to attend Moscow Affiliate Conference 2018 tomorrow? Looking for crypto traffic! Cosmic offers are waiting! We are looking for crypto traffic. Doing better for mailing or social networks traffic. Various GEO directions are welcome. The most demand in Europe, Russia and Australia traffic. We have high rates for you by deposit starting from $320 to $600, depending on geo. Restrictions by traffic - no underage traffic, no fake identification or stolen cc´s. Interested? Don't hesitate to join! Let us present some good news for you! We are glad to inform you about our latest update - 2-Factor Authentication option to make your iMonetizeIt account even more secure! Our developers team has implemented a new option in the Profile section - Security. In this tab, you can activate a 2-Factor Authentication that enables to keep your information safe like in the so-called code vault. 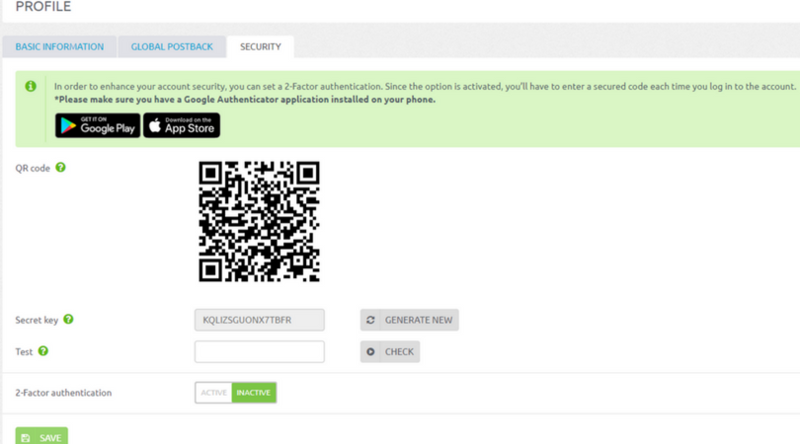 Once a 2-Factor Authentication option in your account Security tab is activated, your application will generate a unique secured code that you’ll have to enter each time while login into the account. More details on how to activate the 2-factor option you can find in our FAQ article. Keep your information confidential and gain unprecedented profits with our service! The must-attend event is coming on 18-20 July in Barcelona! 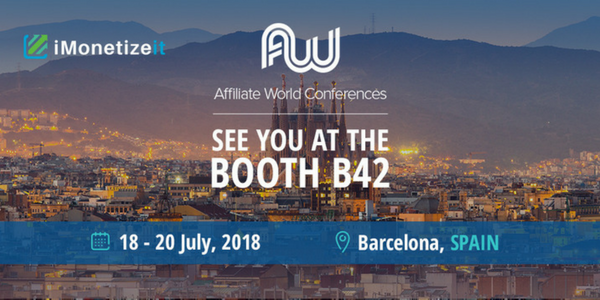 Affiliate experts, marketing professionals, networking opportunities - meet all at the Affiliate World Europe Conference. Go ahead to book a meeting in advance. See you soon! 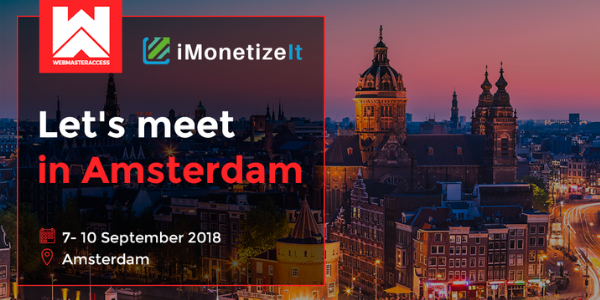 Meet us at the Webmaster Access 2018 Conference! We are proud to be a Sponsor of Speed Networking Gathering. Five different times throughout the Conference and every visitor can participate! Don’t forget to to sign up 30 minutes before the event to get a spot in the room. The precise time you may find out from the Conference schedule. Book a meeting with us and ask all your questions of affiliate marketing! See you at the WMA 2018! Hello guys! I have wonderful news for you! 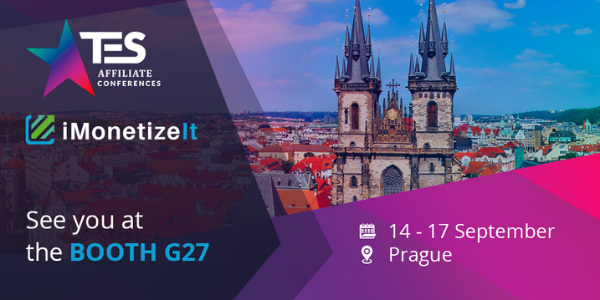 Meet us at the European Summit 2018 in Prague. 14 till 17 September 2018. Affiliates,media buyers, advertisers, and publishers meet to exchange some knowledge and propose new ideas for the affiliate-marketing world. Visit the TES 2018 and learn essential skills for your business. Please spend some time and schedule a meeting with us at the most convenient time. See you at the TES 2018! We announce a new conference – the MAC 18. It will be held 3th October 2018 in Kiev. At the Conference we are going to organize a special lottery, where every participant can win one of our perfect presents. And now we are going to play FIVE FREE tickets for this Conference! Here are the rules - just follow our Facebook page and leave any comment under the latest post. Then the winner will be chosen with help of the randomizer. Hurry up and don’t lose a chance to get your MAC 2018 ticket for free! We are happy to announce a new fascinating conference - the Kiev Affiliate Conference 2018. The event will be held in Kiev on 3 October 2018. 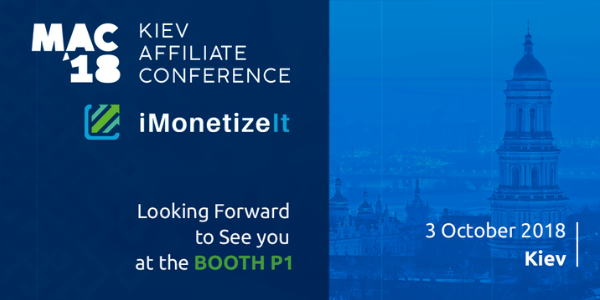 The MАС 2018 is a perfect place to find out new affiliate trends in 2018.
iMonetizeIt is proud to be a platinum sponsor of this event. Go forward and schedule the meeting with us! See you at the MAC 2018! Do you wish to get Apple watch or mountain bike as a gift? IMonetizeIt team invite every partner to join our Loyalty program and get opportunity to become owner of various rewards. The only thing you need is to get high profits with us and earn iMonets. The more iMonets you get – the better gift you will receive! Among our TOP rewards are smart gadgets, electronic devices, goods for sports and traveling and many others. The amount of bonus points and the list of gifts you can check in your "Loyalty Program" tab. To join program, please visit “Loyalty Program” section and click “Enroll Now!” Button. The loyalty program doesn’t have time-frame, every partner can get presents even if you stop working. Wish you great day and high profits! The week has already started, it’s time shovel up profits!!! Take a look at TOP eCPM for our smartlinks. Norway is leading this week! Please note: eCPM is general data on the platform for the last 7 days. Your rates can be different. Why is a personal account manager the key to success? Often have to explain to online support twice? You’re already dreaming of holding a brand-new iPad Pro in your hands, and you’ve still not receive any call back to confirm your order. Indifference and inability to discuss the details with the same person really infuriates. Everyone wants to clarify something of their own and such an approach steals a lot of time and efforts, so the happiness from the purchase loses its significance. That is why our team offers a personal account manager for every user. Find a friend with iMonetizeIt! Personal account manager can bring you various opportunities for the comfortable collaboration. Comfortable working conditions with iMonetizeIt is our main principle. Let's warm up this cold autumn with fresh Top on eCPM. 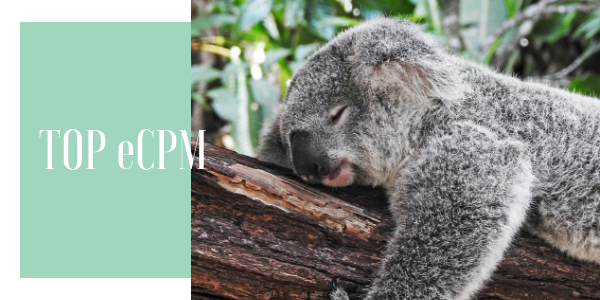 ✔️Please note: eCPM is general data on the platform for the last 7 days. Your rates can be different. Have no time for testing, optimization, and creation of pre-landing pages? SMARTLINK is exactly what you need! Grab one (or many) of our vertical-specific smartlinks: Dating, Mainstream Dating / Gay Dating / Sweepstakes / Mobile Content (Adult) / Pills. Let our platform do all the work for you and make traffic monetization simple and fast. Smartlink is the best way to monetize Social traffic. Our machine learning algorithms detect a traffic type and all its parameters to make sure the right traffic reaches the most relevant TOP offers and performs at its best. Join us today and estimate advantages of using the smartlink from iMonetizeIt. We’ve actually been around for a while, but are excited to update our official thread here to have a direct communication channel between the best Affiliate Marketing community on the Internet and our network iMonetizeIt. iMonetizeIt smartlink is an automatic traffic distribution system that allows to monetize ALL (100%) available WORLDWIDE traffic with maximized revenue for each publisher. Our machine learning algorithms detect traffic type and all its parameters to make sure the right traffic reaches the most relevant TOP offers and performs at its best. iMonetizeIt delivers 1B+ clicks and generates 2M+ conversions monthly. 1) Grab one (or many) of our vertical-specific smartlinks - let our brainy platform do the best possible job for you and make your traffic monetization fast and simple. Also, a smartlink is the best way to monetize Social traffic. 2) Run specific offers via our CPA Marketplace – pick and choose CPA/CPL/CPS offers with the highest payouts from direct advertisers (including plenty of exclusives) that work best for you. Our strongest vertical we're known for is Adult Dating where our worldwide smartlink solution is one of the best ones in the market. Other than Adult, we also cover such niches as Gay Dating and Mainstream Dating with individual smartlinks for each. Furthermore, we're growing fast in the Sweepstake vertical (including SOI and CC submit offers). Just like in case with Dating, you can run both individual sweep offers or use our smartlink. - you can benefit from the Referral Program and Loyalty Program with exclusive prizes. Ready to monetize with us? Please SIGN UP HERE. One of our great AMs should be in touch with you shortly. Are you a direct advertiser? Ready to feel the combined power of our high-quality targeted traffic and advanced smartlink technology? Please use Skype and email above to get in touch and discuss how we can deliver the BEST leads that work for YOUR product! It will be our pleasure to do business with each of you guys! Your friends can help you to earn money! Referral program is additional opportunity to grow income from collaboration with iMonetizeIt. Join the program and get 5% from referrals’ profits. Every user has unique referral link, which can be used for attracting new partners to work with iMonetizeIt. Every new user, who sign up using your ref. link, will bring you additional income. The more referrals you have - the higher profit you will get! Already bought tickets for AWA 2018? Our team is pleased to invite you to attend the best conference of this winter - Affiliate World Asia 2018 in Bangkok. We will be waiting for you there on December 5th-6th. The iMonetizeIt team is proud to be the Premium Sponsor of this conference. Do not miss the chance to listen to the best speakers of affiliate marketing. The conference will be attended by over a hundred companies that are open to cooperation. Come and get unforgettable experience, plunge into the world of affiliate industry with us! See you at AWA 2018!